Welcome to the new site for my blog. The delay in writing a new post since the last on my old blogger site has been because of the changeover to our brand-new site, master-minded by the amazing Jenny Keal. She’s not only my dear partner-in-paint, and a great pastellist, but she has been working at great odds to get it all working. I hope you get a seamless transfer from old to new, without any hitches, though knowing the computer world, I somehow doubt it will be entirely dreamlike! We had another lot of snow last night – beautiful large flakes that floated down gently, but by morning most of it had gone. So instead of snow I’ll cover rain today. 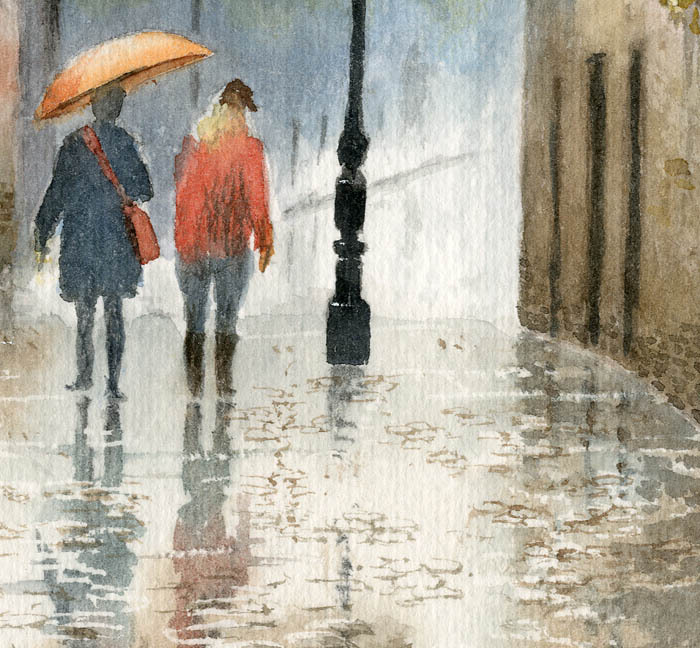 Light rain falling on a hard surface, perhaps with a hint of background light can be a delight to paint, and trying to capture the effects of this can be very rewarding. This watercolour, which is part of a composition, shows a wet day in Hackney, on a part-cobbled surface. Most of the painting, including the general colour on the ground, the figures, lampost and wall, were painted first, and when all this was dry I described with a weaker application of paint the reflections. While they were still wet I punctuated them by dragging a damp flat brush horizontally through the reflections. After allowing all this to dry I then lay a wash of pure water across the foreground to reduce the strength of the reflections and at the same time soften their edges. Note that in doing this I avoided the lamp post, wall and legs of the walkers. This method is an alternative to the wet-into-wet technique, which some may well find easier to handle. The full painting is in my book Skies, Light & Atmosphere, which can be obtained from our website, and has an accompanying DVD of the same title – the special offer on these two items is available solely from ourselves. This entry was posted in David Bellamy, Painting wet pavements by David Bellamy. Bookmark the permalink. Astounding painting! I wonder if i coul’d paint some ground reflections like these one day! Thanks for sharing your techniques.